Prepare 3 9" cake pans, set aside. In bowl pour your oats and then pour your water over them, stir and let sit for about 10 minute. Meanwhile in another bowl beat together your butter and sugars until light and fluffy. Add your eggs and vanilla and continue to beat until combined. In separate bowl mix together your flour, baking soda, baking powder and salt. Slowly add your dry ingredients into your wet until just combined. Beat in your oatmeal and then fold in your mini chocolate chips. Spread evenly between your prepared pans and bake for about 25 minutes or until golden and center is set, remove from oven and turn out onto cooling racks to cool completely. Meanwhile to make your frosting in large bowl beat together your butter, shortening and peanut butter until combined. Add in your powdered sugar slowly until desired consistency is reached. Once cakes are cooled to assemble; place 1 layer of your cake on a turntable and top with about 1/2 cup frosting and spread out to sides. 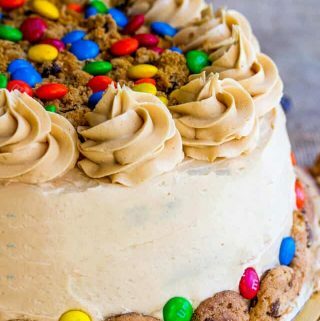 Sprinkle with about 1/4 up of your crushed M&M's, add another layer of cake and repeat your frosting and crushed M&M's. Top with remaining layer of cake and stating from top add your frosting and frost down around sides until covered, reserving about 3/4 cup for decorating. Once cake is frosted, add your remaining frosting to piping bag fitted with an open star tip and pipe swirls around top. Add some crumbled oatmeal cookies and M&M's to top. Breaking your mini oatmeal cookies in half, add them to bottom of cake.